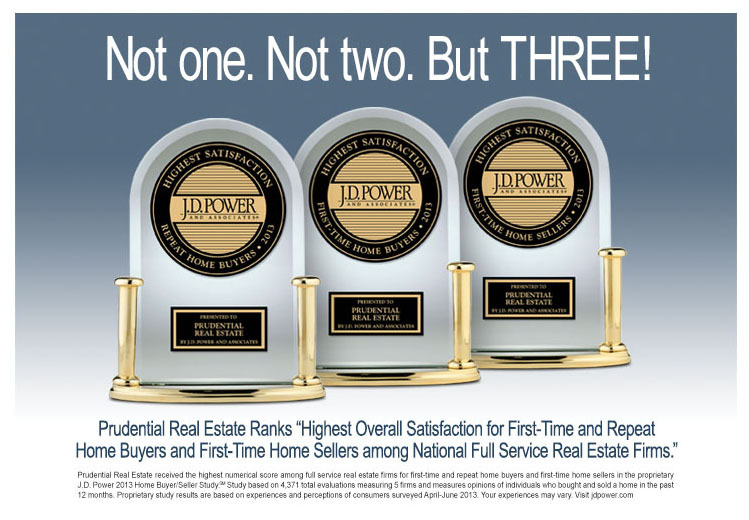 (Windham, New Hampshre) - Prudential Real Estate, an HSF Affiliates LLC company, and Prudential Dinsmore Associates, REALTORS announced that the Prudential Real Estate affiliate network ranked highest for customer satisfaction in three of the four segments included in J.D. Power and Associates' annual Home Buyer/Seller Satisfaction Study. The network scored highest in Repeat Home Buyer, First-Time Home Buyer, and First-Time Home Seller categories. It ranked third in the Repeat Home Seller segment. The sixth annual study measures customer satisfaction among the nation's largest real estate brokerage companies. Overall satisfaction is gauged across four factors of the home-buying experience: agent/salesperson, real estate office, closing process, and variety of additional services. Seller satisfaction is evaluated through the same four factors plus marketing. Among repeat home buyers, Prudential Real Estate scored 829 on a 1,000-point scale, performing particularly well in agent/sales person, variety of additional services and closing process. The network tallied 811 points among first-time home buyers, showing strength in all factors. Prudential Real Estate scored 809 points in the First-Time Home-Seller segment, drawing strong marks for marketing and closing process. This represents the third time in six years Prudential Real Estate ranked highest in seller satisfaction including recognition in 2008 and 2010. "Prudential Real Estate stands for quality and consistency in neighborhoods across America," said Earl Lee, network president and CEO of HSF Affiliates LLC. "Buyers and sellers alike appreciate our affiliates' market leadership and our agents' skill and innovation." Lee added that the Prudential Real Estate network enjoys one of the industry's highest average selling prices and that its agents stand out as local-market experts. "Affiliate to affiliate, Prudential Real Estate sales professionals have a strong work ethic and drive for client satisfaction. These prestigious awards further underscore our agents' success and the quality of our network." The team at Prudential Dinsmore Associates REALTORS works hard to exceed the expectations buyers and sellers alike, explained Brad Dinsmore, broker/owner. "In today's market, our clients require all the expertise and service we can offer. Through our knowledge, innovation and guidance we maximize the home-buyer/home-seller experience to ensure our clients' needs are met." First-time home buyers and sellers are most influenced by a company's good reputation and the recommendations they receive from friends, family and colleagues. More than one-third (35%) of first-time home buyers and 27% of first-time sellers indicate they selected their real estate company based on its reputation. 28% of first-time home buyers and 27% of first-time sellers selected their company based on recommendations. Overall satisfaction with real estate companies is higher among repeat customers compared to first-time buyers or sellers. Suggesting better times in residential real estate, the percentage of first-time home sellers increased to 44% in 2013 from 30% in 2012. The percentage of first-time home buyers also increased significantly, 49% in 2013 vs. 40% a year ago. The 2013 Home Buyer/Seller Study includes 4,371 evaluations from 3,930 respondents who bought or sold a home between March 2012 and April 2013. Prudential Real Estate is a part of the HSF Affiliates LLC real estate brokerage family, which includes Real Living Real Estate and the new Berkshire Hathaway HomeServices brand available later in 2013. Prudential Real Estate franchisees are independently owned and operated. HSF Affiliates LLC, based in Irvine, Calif., is a joint venture of HomeServices of America and Brookfield Asset Management. Prudential, the Prudential logo and the Rock symbol are service marks of Prudential Financial, Inc. and its related entities and are used under license with no other affiliation with Prudential. About Prudential Dinsmore Associates, REALTORS. Prudential Dinsmore Associates REALTORS, is celebrating its 35th year as a real estate firm, located in Windham NH. Headquartered in Westlake Village, Calif., J.D. Power and Associates is a global marketing information services company providing performance improvement, social media and customer satisfaction insights and solutions. The company's quality and satisfaction measurements are based on responses from millions of consumers annually. For more information on car reviews and ratings, car insurance, health insurance, cell phone ratings, and more, please visit jdpower.com. J.D. Power and Associates is a business unit of The McGraw-Hill Companies.